Description: This stunning design features the iconic pinecone, one of Mother Nature's most compelling organic symbols, which offers a natural elegance and represents the evolution of human enlightenment. Burgundy and Leaf Green bands edge this woodland shade that highlights Light Brown pinecones and Golden Sun branches on a Beige art glass shade. 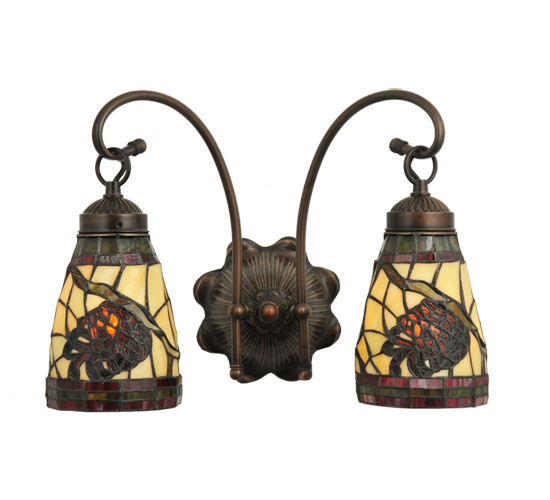 The art glass shade, which is created using the famous Meyda Tiffany copperfoil construction process, is enhanced with hardware finished in Mahogany Bronze. This sconce is UL and cUL Listed for damp and dry locations.